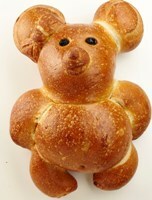 Only our most experienced bakers can create these wonderful hand crafted Sourdough Bread Teddy Bears. Includes 2 1lb Teddy Bear Sourdough bread. From Anonymous of Oak Park, Illinois on 4/14/2018 . From Anonymous of Urbana, Illinois on 1/7/2018 . From Anonymous of Mountain View, California on 9/1/2017 . From Kyle of Alameda, California on 2/16/2017 . From Anonymous of Miami, Florida on 7/3/2015 .